Louisiana QPI outlines the philosophy to which we hold ourselves accountable for the day-to-day care and parenting of children and teens in the custody of the State of Louisiana. 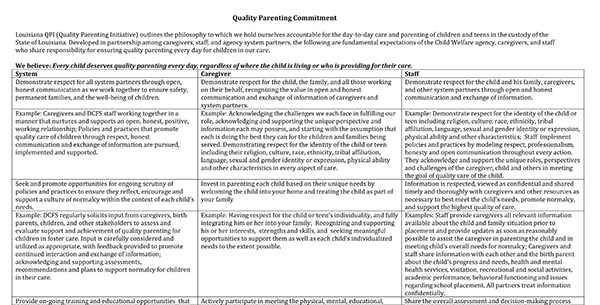 Developed in partnership among caregivers, staff, and agency system partners, the following are fundamental expectations of the Child Welfare agency, caregivers, and staff who share responsibility for ensuring quality parenting every day for children in our care. We believe: Every child deserves quality parenting every day, regardless of where the child is living or who provides their care.